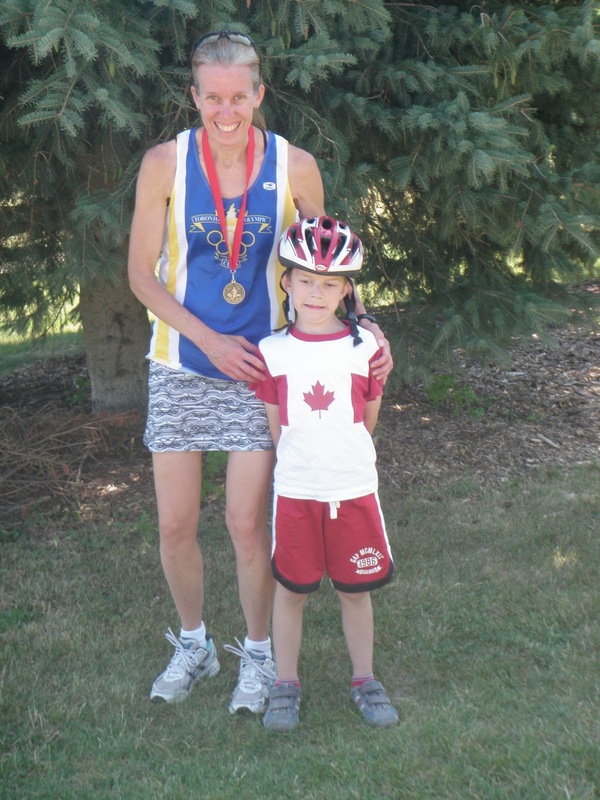 On Canada Day, the boys and I headed to Brantford, Ontario for the Canada Day Trail Run. This was a race that I had been thinking about doing for a while, but I was torn. I had also wanted to run another 5K closer to home on a course that I’ve run over the years so that I could see where I am truly at in my training right now. But I also knew that I shouldn’t be racing as I’m prepping for The Downtown Dash 10K, an Ontario Masters race, in mid-July. So, I opted for the best solution: The Canada Day Trail Run 10k. How was this the best solution? I decided to work the Canada Day 10K into my training and run it as a tempo run so that I could still get my long run in for the day; Coach Kevin agreed this would be fine. Since I hadn’t run a 10K in a long time, running this would also give me a sense of where I am in my training for upcoming The Downtown Dash Most important, though, it would be more of a family event for us. Hubs wanted to help Race Director and friend, Bill Jol, and quickly took on the task of being lead cyclist. The boys could also take their bikes and ride while I was on the course. We arrived in Brantford shortly after 8:00. Dave and Skipper headed out on a golf cart to put up the kilometer markings, Little Ironman hung out with me. We picked up my race kit – which included a beautiful Canada red technical shirt – and headed out to warm-up. LI, who has been joining me more and more on his bike these days, was happy to be my “sidekick” during my warm-up. We headed out on the main road, realized that we had run past the turn into the trails, ran back to find the entrance and warmed up a bit longer – 28 minutes total. On our way back up the hill towards the main road, LI wanted to climb through some trees but we were running out of time. I changed into my singlet and racing flats and headed to the start, looking anxiously for Daddy and Skipper so that I could hand LI over to them. They were no where in sight so LI, on his bike, and I did my strides together, just like we did on Saturday during a run. When we finished, there was no sign of the other two and time was ticking: 2 minutes to start. I parked LI by a tree near the starting line, asked Bill, the race director, if Dave was still riding for him (15 minutes after the 10K left), gave him the car key so that Dave could get his bike and pointed out LI. “Make sure he sees him standing there, ” I said, worrying that he and Skipper would drive right past him. My friend, Jacqueline, was also there waiting for the 5K race to start. “Good,” I thought. “Another pair of eyes.” With less than a minute to go, Dave and Skipper appeared and collected LI and the car key. “That was tight timing,” I thought. “Typical. Now focus.” And I did. The course went into the trails within the first 500 metres and, before long, we were running downhill. I tried to slow down a bit because I wanted to have something left for the hill at the end, but I was also in the front pack and I wanted to hold my spot. As we went further into the woods, we had to go single file and no one wanted to take the lead. I certainly did not because I didn’t want to annoy the men who were with me and have them complain later that some girl slowed them down at the start. So, I stayed back and let them go ahead. Our first kilometre was in 4:07 (downhill) and at 2K, I was at 8:16. I knew I was too fast; my goal pace was 4:30 so I had to make sure to pull back a bit. I was on my target pace and went through at 22:16. I was the lead female and realized that I had a good gap behind me so I set the goal to keep the men that I chased down the pathway behind me. I had looked forward to turning around as I thought there would be more downhill but, by then, I didn’t even notice the ups and downs in the course; it was just plain hot. So, I held my pace, kept the climb at the end in mind, and pushed myself towards the finish. In the last 2K, I was happy to pass 5K runners and walkers as I knew that I was going in the right direction through the trails. A marshall directed me right, I powered up a bit more, and, then, I came to an almost complete stop. Which way do I go? There were no markers and no marshall: straight and flat or right and uphill. What comes down must go up so I went right. Still, I was unsure of myself until I saw the same clump of trees that LI wanted to walk through earlier. I ran past the incline that he got his bike stuck on earlier, came out of the woods and powered through to the finish: First Lady! My time seemed slow – 44:54. But it was also where I needed it to be – at 45:00. Given the heat and terrain, I’m happy with that. And, to confirm my thoughts about the ups and downs along the course, I commented at the end of the race, “Who said that course is flat?” The men who had finished ahead laughed. Jacqueline, who ran the 5K said, “Yeah, flat. Tell him to run it.” It wasn’t Ancaster or New Hampshire, but it was hilly. Then, again, maybe it was just the heat. My friend, Kevin. ran the 5K (First Overall!) and cooled down with me and, as soon as LI saw me, he was back on his bike wanting to ride a bit more. Sunday morning, I put about 19K on my legs and LI rode a total of 8K. It was a great way to start Canada Day. Wow Cynthia, you are totally inspiring! Awesome job and congrats!